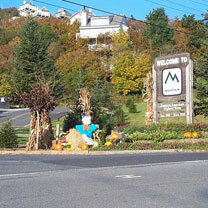 At an elevation of 5,506 feet Beech Mountain is the highest incorporated town east of the Rockies. The Town has a full time population of 350, but the population swells to as high as 10,000 during the winter and 5,000 in the summer. People flock to Beech Mountain in the winter to ski at Beech Mountain Resort and in the summer to take advantage of the mild climate and numerous recreational opportunities. Even though there are only 350 full time residents on Beech Mountain, there were at last count over 2,350 dwelling units on the mountain. Beech Mountain has become a popular location for vacation and 2nd homes for many people from North Carolina to Florida. The Town of Beech Mountain began as a private resort development in the mid 1960’s. Grover Robbins, of Blowing Rock, NC, started the resort along with 40 other investors. The original plan was for Beech Mountain to be an ideal second home for owners to escape the pressures of everyday life and enjoy various summer and winter sports. The Robbins brothers along with the other investors formed Carolina Caribbean Corporation (CCC) to develop Beech Mountain along with several other planned resorts including some on the island of St. Croix. CCC built what is today Ski Beech, most of the Town’s roads, the Town water and sewer system, along with many of the houses on Beech Mountain before filing for bankruptcy in 1974. The Property Owner’s Association, which had been formed in 1970 to collect assessments for the maintenance of roads and recreation areas, took full control of the maintenance of the road system, recreation areas, and water/sewer systems. In 1977, the water and sewer systems were purchased from the courts by the Beech Mountain Utility System, a wholly owned subsidiary of the property owner’s association. In 1978, a Sanitary District was established by the property owner’s association. In 1980, the Sanitary District purchased the water and sewer systems from the property owner’s association. In May of 1981, the Town of Beech Mountain was incorporated by act of the North Carolina General Assembly.